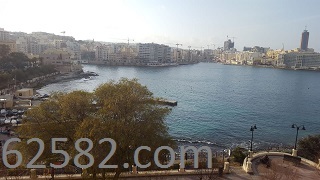 A second floor apartment, just off the Tower Road promenade in Sliema, and forming part of a a modernised classic 1930's building. The apartment comprises two larger than average double bedrooms and one single bedroom/study, with one bathroom and a guest toilet. Open-plan large Lounge / Dining room with a good sized modern Kitchen with utility room. Furnished with all modern amenities. The apartment enjoys stunning views of the promenade and St. Julian's Bay from the Living/Dining room and the single bedroom/study. All furniture and fittings are in excellent condition. Modern lighting and airconditioning throughout. Call +356-99462582 for an appointment.